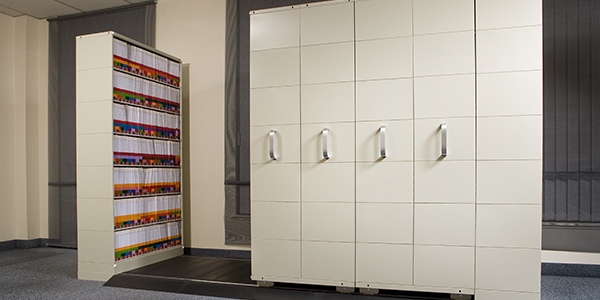 Spacefile’s Mini Storage Aisle is a highly versatile and cost effective solution for light load applications. 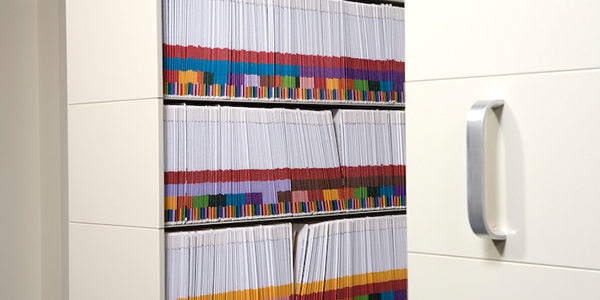 The MSA is an ideal product for office interiors, because of its attractive finish and modular design. The system comes complete with our unique demountable floating floor, allowing for installation on top of virtually any surface without being attached to the floor in any way. Attractive aluminum grab handles with large solid steel wheels enable easy maneuverability. Heavy gage steel welded carriages deliver maximum strength, rigidity and durability. 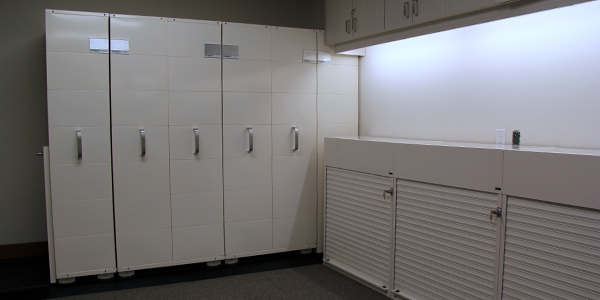 Spacefile’s Mini Storage Aisle is provided complete with our innovative demountable floating floor option, providing maximum modularity. 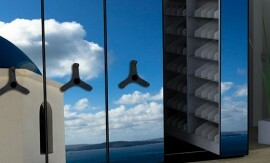 The system can sit on top of virtually any surface without being attached to the floor in any way. 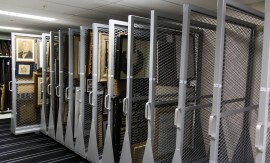 The MSA can be relocated without the need to purchase any additional parts or pieces and modified/expanded to adapt to changing storage needs. The MSA is delivered ready to assemble with simple tools and built in leveling bolts ensure a precisely leveled system. Fully finished anti-slip steel decking is entirely removable to allow for easy access to the floor underneath the system in the case of a flooding and/or for cleaning and maintenance purposes. The innovative track and decking design promotes airflow to reduce the potential of mildew or mold buildup. 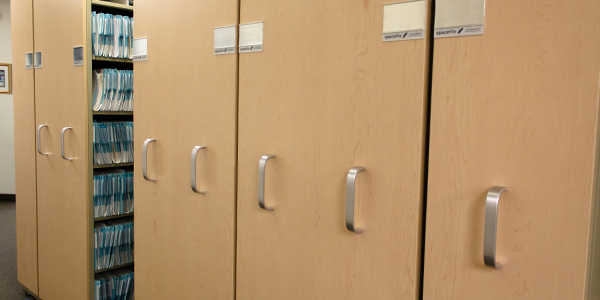 Spacefile’s Mini Storage Aisle is designed to accommodate any of Spacefile’s shelving products as well as integration of third party shelving. 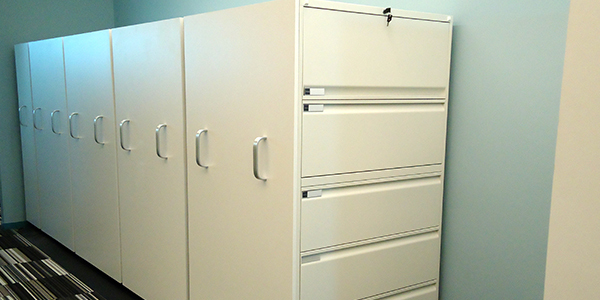 MSA carriages are also available with heavy gauge steel carriage covers for open, large object storage. Spacefile’s MSA has a flexible design to allow for complete modularity. 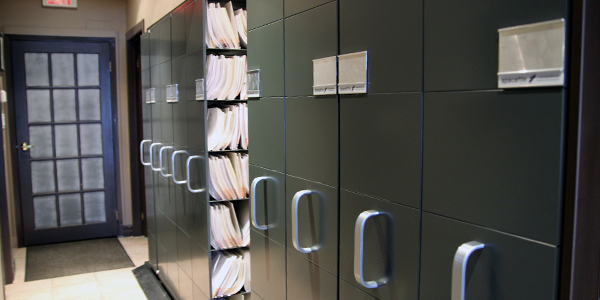 The system has the ability to be relocated, reconfigured or expanded to adapt to changing storage needs. You never loose your initial investment, all carriage components are completely reusable. 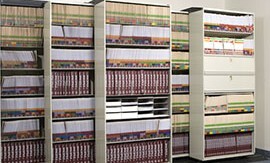 This system change adapt to your changing storage needs or a change in location. 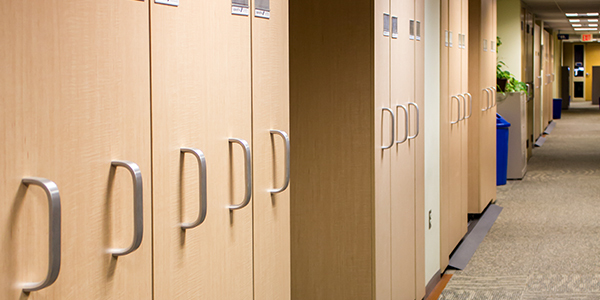 Lockable configurations are available to meet virtually any security criteria. 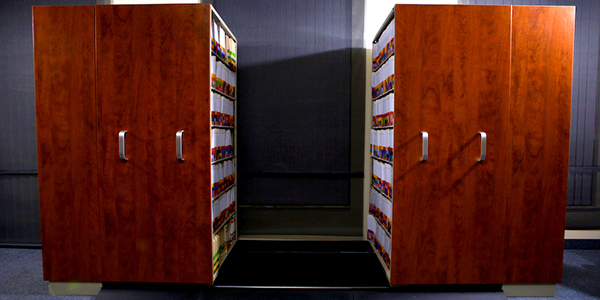 Spacefile's locking systems are HIPAA and PIPPEDA compliant. MSA systems include two attractive aluminum grab handles for each carriage. The MSA is provided with our innovative demountable fully finished floating floor that has built in leveling bolts to ensure a precisely leveled system that will not drift. Carriage stops/brakes are also available to prevent carriage movement. 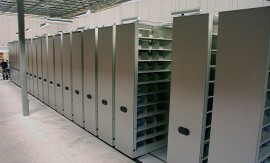 Stationary shelving units adjacent to the mobile system are mounted on stationary platforms of the same construction and height as carriages for a complete homogenous system. Stationary bases are attached to the track and completely anti-tip. Included as a standard feature to all MSA systems unless otherwise stated. Spacefile MSA carriages are fully finished with no visible holes or fasteners. All metal components are finished with powder coat paint, providing a durable hard surface with superior performance qualities. 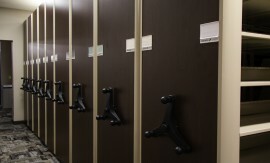 Powder coating provides excellent abrasion, impact, corrosion, stain, and chemical resistance, exceeding stringent scruff, scratch and chip requirements of the American Library Association. Powder coat paint also emits negligible VOCs (volatile organic compounds) for a cleaner, healthier indoor environment. Paint is available in any of our 12 standard colors, our eco-friendly paint option and custom. Spacefile MSA Carriages meet CAL 133 standards for combustion performance and is suitable for compliance with the Boston Fire Code. Spacefile is committed to designing and manufacturing long lasting, environmentally friendly products. Carriages are constructed primarily from sheet metal with an average of 40% recycled content. 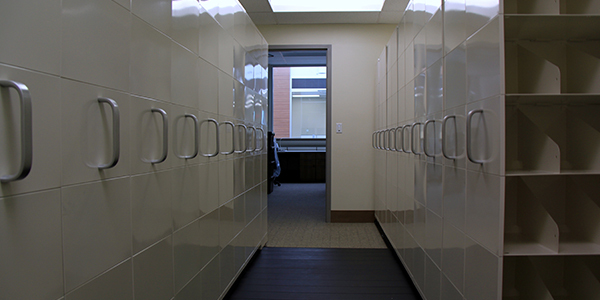 Spacefile products can contribute to LEED accreditation. Please refer to our environmental section for more information. 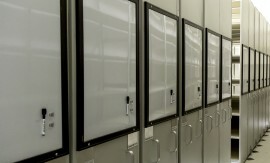 We manufacture a complete line of accessories compatible with our high-density storage systems. 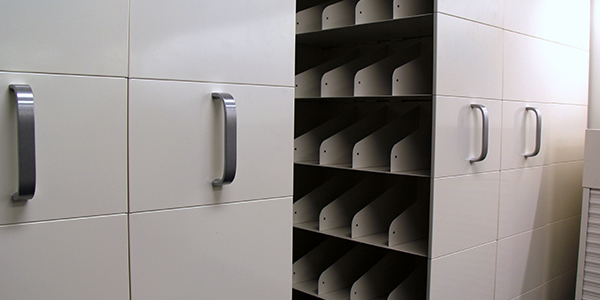 All of our products have the flexibility of adding or reconfiguring accessories to adapt to changing storage needs. Custom accessories are also available. MSA carriages are available with carriage foot stops that prevent unwanted carriage movement when engaged. Foot stops are spring loaded for simple and easy disengagement. Spacefile MSA carriages are constructed from heavy gauge steel and welded together to provide maximum strength, rigidity and durability. Our unique welded frame construction provides the highest degree of structural integrity and durability compared to any other design. The welding process joins material at the atomic level for the strongest possible connection, ensuring the maximum rigidity with absolutely no play or looseness over the entire assembly. Spacefile’s MSA systems utilize wheels integrated with permanently sealed and lubricated ball bearings to ensure smooth long lasting operation with a high load capacity.